As a thank you for all your support and love this year, many of my colleagues want to say Happy Holidays and celebrate the JOY you have given us by always walking with us and beside us...I know that my shop would not be where it is today without all of YOU. So here is the line up of great dollar deals that you can find on Sunshine and Lollipops just search #8daysofchristmas and you will find all these joyful deals for $1.00. 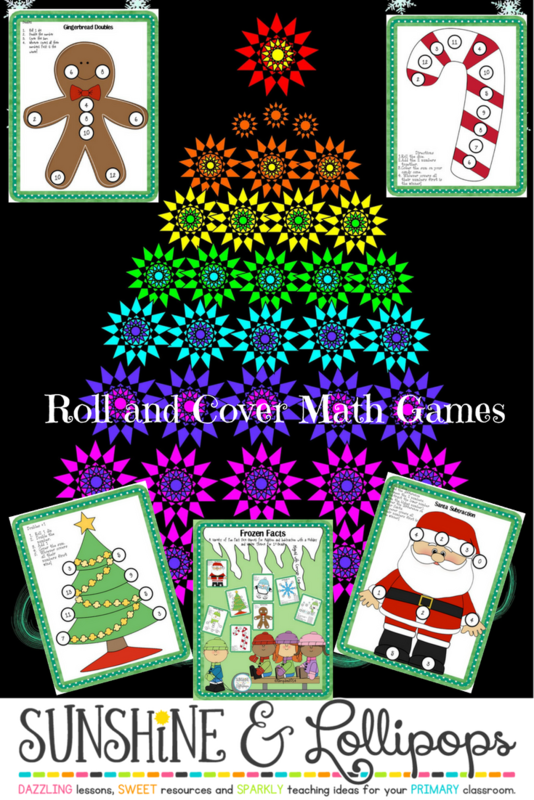 Day 1, December 12th : Winter Fun Roll and Cover Dice Games : This fun Math game is a variety of Fact Dice Games with a Holiday and Winter theme for addition and subtraction created for first grade, but can be used as reinforcement of enrichment for other grades. 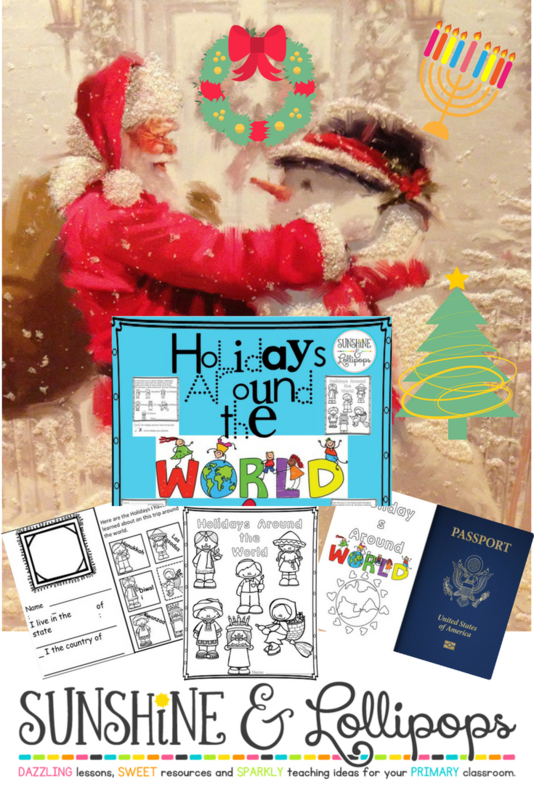 Day 2, December 13th: Holidays Around the World with a Power Point Companion : This packet of Winter Holidays Around the World can be used as an addition to an existing unit or simply by itself. A cover for a folder or booklet if you choose to use this in that way. A summary sheet written in easier language about the following holidays: Christmas. Hanukkah, Kwanzaa, St. Lucia Day, La Befana, Diwali and Las Posadas and a craft idea for each holiday. Writing response sheets for each holiday. A passport and information sheets that can be used. A response writing activity for children to choose a holiday that they don’t celebrate that might be fun for them. A Compare and Contrast partner activity to chat about how they are alike and different in how they celebrate a holiday here in the US. A newly added Power Point Companion to support the pages. 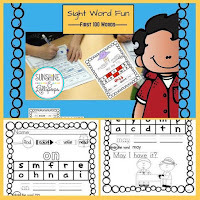 Day 3, December 14th: First 100 Fry Words Practice: Sight Word Practice Fun was created for Kindergarten and first grade but can easily be used as an intervention or reinforcement for sight word recognition. It contains the first 100 Sight Words. It can be used as a packet or you can run off pages by word to reinforce a particular word with which a student needs to work. It is easy to differentiate with this sight word packet! It can also be used as a homework packet. Each word is written on the top of the page and the student is asked to color the word. Reads traces and writes the word. Reads a sentence that contains the word and then circles the word in the sentence. 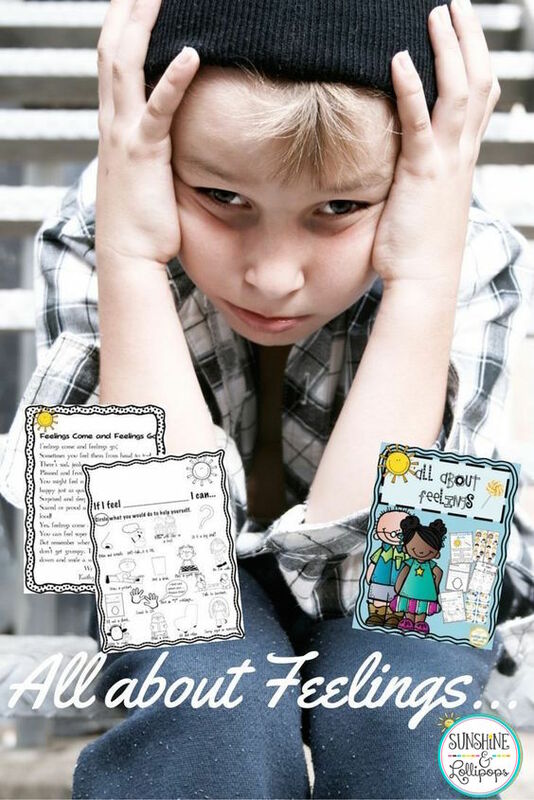 Day 4, December 15th: Social Emotional Growth: All about Feelings: This packet was created to help students express their feelings and to support or think of strategies to help children understand their feelings and why they might feel a certain way in a certain situation. Covers if you decide to make the pages into a booklet or class book. Feelings included are: grumpy, sad, mad, frustrated,too excited, tired, embarrassed, happy, surprised and jealous. Pages to go into the “Cool Down” Spot with selections of what they can do to help themselves feel better and get rid of those “muddy feelings”. An original poster/poem for the “Cool Down” Spot. An original poem entitled: Feelings Come and Feelings Go. Various ways to present “Feeling Strips” for students to show you how they feel each day with frames and ideas as well as larger icons to use and an example of how it might be used in the classroom. Cards with ideas to calm down that can be laminated and placed into the Cool Down Area. FYI... any book about feelings can be used with this resource. Expressing feeling is such an important life skill. Let’s not forget to support this in the midst of all the academic requirements! Enjoy! 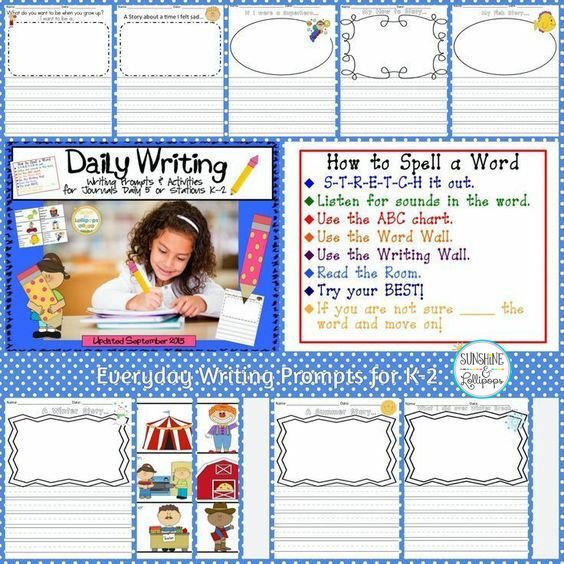 Day 5, December 16th: Writing Prompts and Frames...Daily Writing Activities for Journals and MORE! 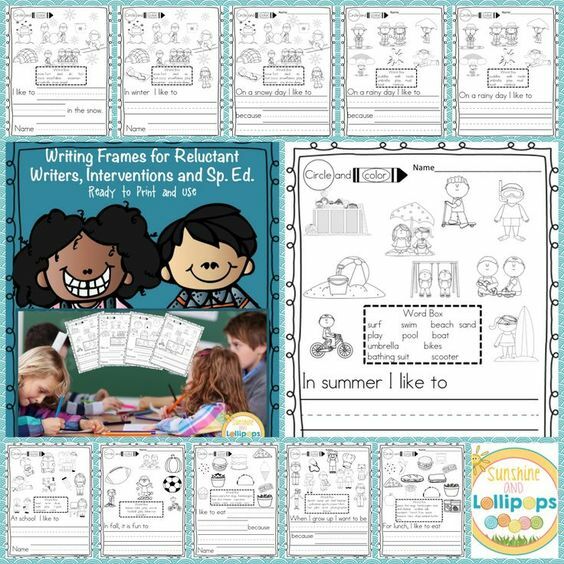 These writing activities are Common Core Aligned and fun for your first graders. An anchor Chart On How to Spell a Word. One complete page with writing lines to run off 2-sided with prompts. This way if students want to write more they can. 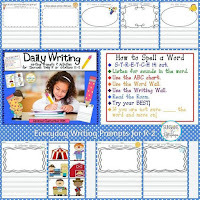 30 cards with writing ideas, pictures and words to assist young writers. These I put in a basket or “Treasure Chest” to choose. Ideas to last a LONG Time that aligned with Common Core!! Enjoy! Remember all these resources are $1.00 on the designated days! Day 6, December 17th: Writing Prompts/Frames for Reluctant Writers, Interventions & Sp. Ed. 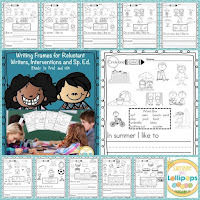 These Writing frames were originally created for a student with special needs who used assistive technology. We needed to find a way for him to participate more fully in the writing program. With these frames, he was able to point to a picture to answer a question and then color it. If he was reluctant to point, we could ask him the answer by the teacher pointing and him nodding or using his computer responding yes or no. We actually used these frames for other students who were reluctant to write or had difficulty writing. It really made a difference and seemed to support each writer as needed. It solved the communication problem in the classroom and made it easier for some of these students to write. Each page has a writing response starter and pictures to choose to answer the question or fill in the response. The child circles the picture that responds to his/her answer and then colors it. There is also a word box with words to partially represent the pictures. The students can use the word box to help them with their writing and if needed, they can circle words they might want to use in their writing. Enjoy!! 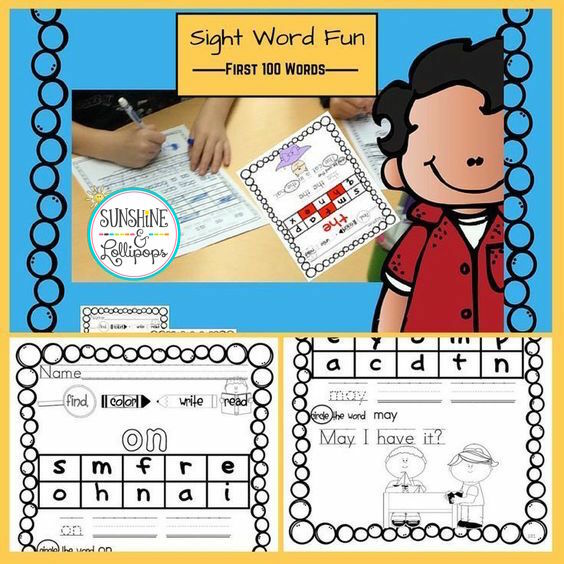 We all know how many times a child needs to see a sight word before it is completely memorized and fluent. 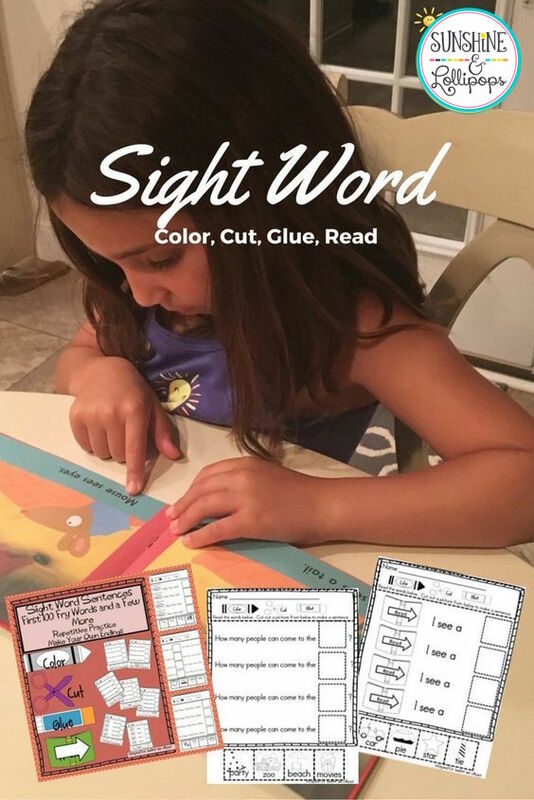 These practice pages will make sight word recognition fun and repetition easy as children color, cut and glue words form the bottom of each sheet to create complete sentences to read. Each sentence has the same words repeated in the same sentence 4 times, but each time the child supplies a different picture with word label to construct the sentence. This will become a growing bundle starting in 2017...so if you pick it up for a dollar, you will receive all the updates without paying any additional cost even when the price is higher as I add more activities!! This is a goody!!! 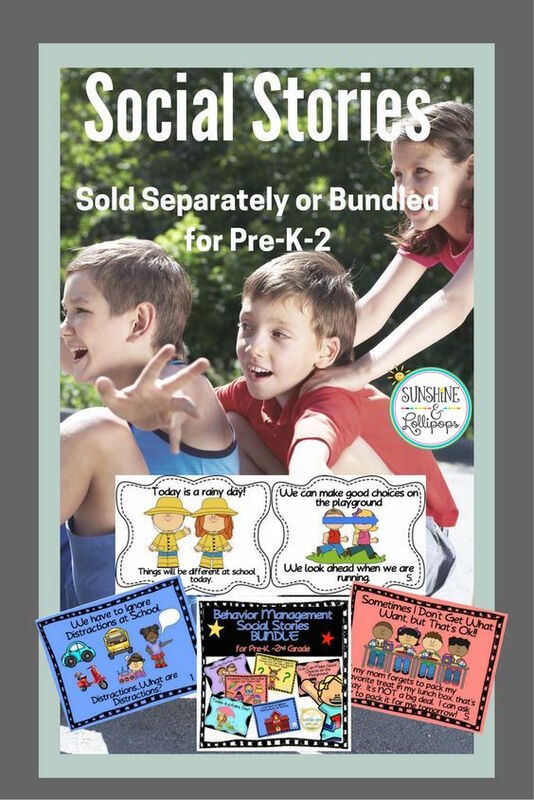 This Classroom Behavior Management Social Stories and Skills Bundle includes 5 Social Skill stories that are sold separately in my shop. There are actually 6 resources, but one includes 2 social stories. One story is about outdoor recess and the other is about indoor recess. These resources wee especially created for a Kindergarten Special Education classroom, but can be used in any classroom from Pre-K to 2nd grade as you can discuss these stores as you read them with your entire class as a Power Point or individually on the computer and ask questions according to the needs of your class or individual students. That is the beauty of this resource. It can be used in many ways...your choice! Each of these resources have been used in classrooms with great results!!! Teachers will sometimes reread the recess stories right before going out to recess as a reminder or after a child has a meltdown due to some specific social situation. For ELL parents to understand the behavioral expectations as the picture give a clear understanding. I hope you find some resources that you can use in your classroom. Wishing you a Joyous Holiday Season and a year filled with happiness and good fortune!!! Happy Holidays and THANK YOU! !